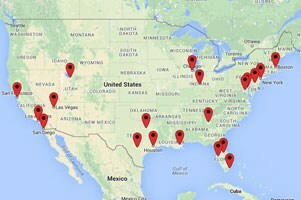 Our company has over 15 AV Rental Locations nationwide. Our staff is passionate about their role in ensuring your equipment selection, setup, and logistics are always flawless. The sky is the limit when it comes to how we will put our equipment and expertise to work for you. We custom-tailor each event to meet our clients individual needs. AVRexpos works with organizations and companies in every industry there is, from healthcare to construction. We have the attention to detail and sense of urgency required to make sure your event is successful. We also service trade shows, and general sessions throughout the country. AVRexpos is a top provider of AV Rentals Nationwide. We have a large inventory of LED Screen Rentals as well as AV Rentals in Nationwide including live sound, LED Screen Rentals, and touchscreens. We also carry seamless video wall rentals, and custom LED panel rentals. Our company is one of the nation’s top providers of audio visual services. We are serving the Nationwide event industry area including, but not limited to, trade shows, general sessions, and live events. We also rent equipment such as live sound rentals, 4K monitor rentals, and UHD / HD monitor rental. Our inventory also includes brand new 4K touch screens monitor rentals and touch screen monitor rentals with kiosks. We also have 46″ NEC MultiSync X464UN-2 Seamless Video Wall rentals and Unilumin 2.6mm LED panel rentals. Let us help you make your next event a success. We carry the latest in AV products to ensure your show or event meets the highest standards. Our LED Screen Rentals are updated yearly to match the current technology trends. We have a combined 25 years in the industry worth of experience so let us bring that knowledge to your next project. Order with us online or call one of our sales representatives today for your instant quote at 1-800-239-1523. Baltimore | Boston | Dallas | Houston | Indianapolis | Las Vegas | New Orleans | New York City | San Diego | San Francisco | Washington DC |And more….